Hi we are the Quijas family. We live in Colorado and we love it here. We decided to create this web page to share our family story, in particular our son Isaac's story. Martin and I have been married for 17 years. 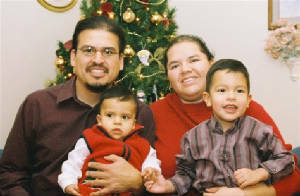 We had our first son Isaiah in 2002 and our second son Isaac in 2004. Isaac was born with VACTERL. To learn more click on the links "What is VACTERL?" and "About Isaac". Please feel free to provide any comments about this website.